Six entries were received in response to the request for nominations for HSC of the Year for 2011. The award will be presented at the 2012 HSC AMSC conference in Pittsburgh on the evening of August 28th. The citations for each committee and the Voting sheet are posted on CG Homeport at: http://homeport.uscg.mil (follow path: Missions > Ports and Waterways > Harbor Safety Committees > General Information). Instructions on how to forward a vote to the Coast Guard are described in the site. For any questions related to the voting process please feel free to call or e-mail Dennis Fahr at 202-372-1531 or Dennis.Fahr@uscg.mil. Thanks for your efforts to make this a successful event. The Coast Guard is now accepting nominations for HSC of the year for the period January through December 2011. This is a chance to recognize the valuable contributions that your HSC has made in your port and for the Marine Transportation System. The winner will be recognized on Tuesday evening, August 28th, 2012 at the 2012 Joint Harbor Safety Committees-Area Maritime Committees Conference hosted by the Waterways Association of Pittsburgh. Please use the format below for nomination submissions. Deadline for nomination submissions is COB 16 July, 2012. Nominations will be posted to this website and to CG Homeport at http://homeport.uscg.mil (follow path: Missions > Ports and Waterways > Harbor Safety Committees > General Information) for voting by 18 July. Votes should be returned by e-mail addressed to the CG-WWM-CorrespondenceInbox@uscg.mil, not later than 1 August. For any questions related to the HSC of the Year award process, please contact Dennis Fahr, Dennis.Fahr@uscg.mil, 202-372-1531, or James.R.Bigbie2@uscg.mil, 202-372-1530. Submissions will be judged based on the organization’s activities conducted from January 2011 – December 2011 and the cited beneficial outcomes resulting from those activities. Planning for the 2012 National HSC/AMSC Conference continues with our next telephone planning session scheduled for Tuesday June 12th at 2:30 p.m. EDT. Work on the presentation topics and speaker list continues and registration is now open on the TRB website. If you would like to contribute to this planning effort, to provide valuable conference topics and appropriate speakers, please contact Mr. Dennis Fahr at 202-372-1531 for call in details. We look forward to your input! related activities in your areas, please contact her at sfaulk@shiptoshoreco.com . Thanks to community feedback, we've added links to two important HSCs. The LCRHSC is an open forum comprised of public and private stakeholders in Oregon and SW Washington with vital interests in assuring safe navigation to protect the environment, property and personnel on the waterways within the Lower Columbia Region. LCRHSC stakeholders accomplish the mission by adopting or developing appropriate standards and guidelines that address environmental and operational elements of maritime operations unique to the Lower Columbia Region. The LCRHSC provides an inclusive, cooperative and equitable venue for addressing waterways issues to ensure the continuation and improvement of prudent management practices for our local waterways. Throughout the process, the LCRHSC strives to ensure reliable and efficient marine transportation. The mission of the PSHSC is to provide a proactive forum for identifying, assessing, planning, communicating, and implementing those operational and environmental measures, beyond that which is in laws or regulations, that promote safe, secure, and efficient use of Puget Sound and adjacent waters. The committee is made up of delegates appointed by broadly based organizations representing a span of interests focused on Puget Sound. Additionally, various governmental agencies formally support the work of PSHSC in advisory roles. You can see PSHSC information at this website (link also available on the right side of the blog) http://www.pshsc.org/. Please let us know if you know of any other HSC websites we can link to. We also continue to invite guest blog posts. If you'd like to publicize the outstanding work your HSC is doing, we'd love to help through this blog. SAVE THE DATE! The 2012 National HSC/AMSC Conference planning is well underway. The event is shaping up to be one of the best ever. 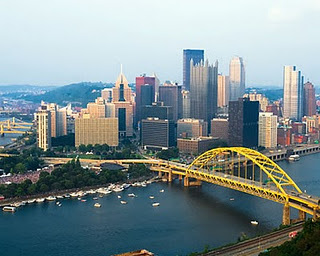 Please mark your calendars for 28-30 August 2012 and plan to join us in Pittsburgh, PA at the Omni William Penn hotel. More details will be forthcoming in the near future so please stay tuned to this blog. The event is being organized by the Waterways Association of Pittsburgh and the Port of Pittsburgh Commission with the assistance of Coast Guard Sector Ohio Valley and Marine Safety Unit Pittsburgh. We look forward to seeing you there next August! If you would like to participate in our next telephone planning meeting on November 22, at 2:30 pm, please contact Mr. Dennis Fahr at 202-372-1531 for call in details. Your input is important.